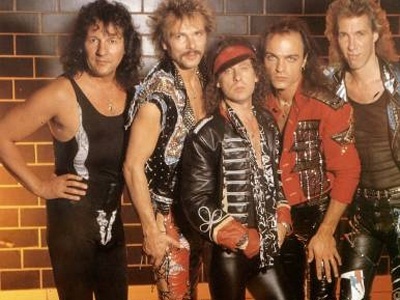 If someone doesn’t write about The Scorpions' Rock You Like a Hurricane for this month’s theme, then we aren’t a music blog. An original staple of MTV’s rotation, Rock You Like A Hurricane was the first brush with fist-pumping, head banging glory for every single kid on earth, of a certain age. It came out in 1984. That made me 13 years old when this track blew up. It has since gone on to hold a prominent niche in popular culture. From sporting events to 80s nights at the bar to soundtracks to…well, you know. You’ve heard it. Everywhere. It’s an interesting track: a cross-over heavy metal hit, it speaks to many of the motifs we’ve come to associate with a certain era: big hair, flashy, sexed-up videos, rapid fire guitar solos, strange looking little fellows becoming rock gods…the ‘80s, may they never return. Standouts in my memory? The video, featuring a strange twist on the ‘caged beast’ theme: the band is jamming out in a very rickety cage, surrounded by a pack of scantily clad, snarling animal-women, afraid of what might happen should this pack of overly-estrogened maniacs get inside. I think Motley Crue used the same theme. Roger Corman made a career out of the same theme…but that’s another era. Rock You Like A Hurricane is a strange, buzzed out, psycho-sexual fantasy, to be sure. But for the 13 year old boy I was, it set the standard for ‘hot rock chick’ and colored more than a few strange and hard to understand, even harder to shake, fantasies. Then there’s the song: pure power chord madness, riff rock at its very best. The dual guitar attack has a distinctly a phased-out sound, lending just a slight trippy edge to the song. It's not the greatest song ever written, but it does have an immediate hook that makes it perfect for radio. Long after a lot of good music has been forgotten, Rock You Like a Hurricane will still be getting played. It inspired me to a mean air guitar. Eddie Van Halen inspired me to a real guitar, but that’s for another post. What’s odd is, for all its ubiquity in popular culture, Rock You Like a Hurricane never made it past 25 on Billboard’s Hot 100. Not that this is the only way to determine a song's status as a hit, but it seems for all the times you’ve heard it, bobbed along to it, cheered on your favorite team it, or echoed Klaus Meine’s “Here I ammmmmmm…. !” it should have been a number 1. L.A. Woman (1971) was the last album that Jim Morrison was actively involved in - sadly he passed 3 months after it came out. What do you think he would have evolved into had he remained with us? 6th in the Doors' series, following The Doors (1967), Strange Days (1967), Waiting for the Sun (1968), The Soft Parade (1969) and Morrison Hotel (1970), the L.A.Woman album reached 9th place on the Billboard charts. It was fairly obvious that Morrison was having troubles by the time L.A.Woman came out. He barely (not) made it through a December 1970 tour - cut short - filled with sloppy performances and ending with a show in New Orleans that was his last. 7 months later, he was dead - in Paris, France, age 27, circumstances somewhat cloudy. Booked for indecent exposure (among other crimes), flamboyant beyond acceptable standards even for a stage star - Morrison's career was stormy -likely more legendary than proven in fact. There is, however, little debate about the stormy aspects, much of it documented following the Doors' rise to fame (and Morrison's scrambling descent). 3 Touch Me - the vocals! Wow! Now, the Doors were great partly because their "basic"/minimal style provided all that was needed to keep the beat going - PLUS - they had Morrison's stage/vocal extremes. 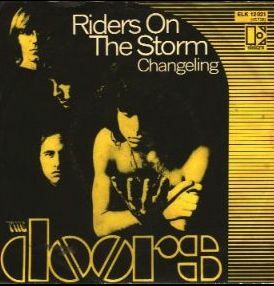 Riders on the Storm added the external storm & thunder sound to great effect - a relatively new concept in the early 70s - whether by keyboard effect (still new) or by dubbed external file - these are days 30 years before mp3s that you could insert as an additional Audacity track. We transition from Blood to Storms with this great track from Peter Gabriel. Two of the best concerts I ever saw were Peter Gabriel shows. He was a riveting performer—some people just know how to command a stage—and the music that he made was complex, interesting and intense. Gabriel’s reputation as a live performer began with Genesis, when he would appear on stage in a variety of bizarre costumes, masks, headgear and makeup, but in the two solos shows that I have seen, he was mesmerizing, even without a single fox head. The two shows were also very different. The first one was in 1980, at the Asbury Park Convention Center. I’ve written about the opening act, Random Hold, and how it was fun being sort of recognized in our brand new WPRB T-shirts. At the time, Gabriel was still kind of a big name, but not what I would call a superstar as a solo act. His first album was all over the place, although it did have “Solsbury Hill” on it—still one of my favorite songs. I happened to enjoy his second album a great deal, although opinions were and are mixed (Gabriel refused to include any of the songs from it on his first “Greatest Hits” collection). But his third album (titled like the first two Peter Gabriel, and generally referred to as Melt) was where he seemed to put it all together. It is a dark, foreboding album, filled with menace and many songs about borders and frontiers, both internal and external. Unlike his first two discs, it was consistent throughout, and without any really weak tracks. This was the material that Gabriel drew from for the bulk his Asbury Park show, starting with the album and show opener “Intruder,” which popularized the “gated drum” sound that later became an 80s cliché. Although it was not a small space, the Convention Center stage was not huge, and the show was not lavish, but it was effective. I will never forget how blown away I was after leaving the concert. After Melt, Gabriel released the similar, maybe even more atmospheric, Security, which featured the song “Shock the Monkey,” then put out an excellent live set and did the soundtrack to the movie Birdy. One morning in mid-1986, I had just gotten up and turned on the radio in bed. The DJ announced a brand new song from Peter Gabriel, which immediately piqued my interest. It was “Sledgehammer,” a song that was so unlike anything I expected from Gabriel, with its funk beat, horns and playfulness. Based on the remarkable quality of the music, the great videos and, later, the movie, Say Anything, the album So catapulted Gabriel back to superstardom. “Red Rain,” though, is not from the playful end of the spectrum—it is, instead, a solemn song about serious issues such as AIDS and nuclear fallout. The exact meaning of the red rain symbolism is unclear, or at least it derives from a number of different dreams that Gabriel had, some of which include blood falling like rain. The hi-hat that is prominent was played by Police drummer Stewart Copeland, which represents the rain. I saw Gabriel for the second and last time on the tour for So, at Madison Square Garden in December, 1986 with my future wife. I remember that show because, not only was the music great, the show was big—lots of lights and lots of musicians on stage (many of them from Super Etoile de Dakar, the band of Youssou N’Dour, who opened the show and also sang with Gabriel, most memorably on "In Your Eyes"). The video above is a crappy video of “Red Rain” from a later show on the tour, which gives some sense of the power of the song live. The last time I posted an mp3 of a Gabriel song, I was cited for a copyright violation, and will not risk that again. I have to say that after So, I found Gabriel’s music less interesting. It almost seemed like he was trying too hard, and his music became difficult and unenjoyable. And then, for a few years, he focused on cover projects and orchestral versions of his songs, and they were not to my liking either. He’s working on a new album now, and will be touring with Sting, so we will see in what direction this always interesting artist will be heading.